Professionally recorded, mastered and distributed on Amazon, Audible and iTunes. 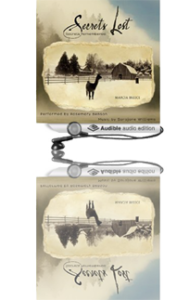 Add credibility and increase profits by offering an audiobook version of your self-published book. Until recently, self-published audiobooks were out of reach. Times have changed! Thinking about DIY audio files? If you’re thinking about recording your own audiobook, understand that it’s do-able but beware. As authors, we hear the characters in our heads, feel the salty breeze and smell the bread baking. Most of us, however, have no experience translating our written inspiration for the listening audience. It’s difficult enough to do an effective bookstore reading. We are usually unaware of traffic noise, police sirens, barking dogs or the neighbor’s crowing rooster but if we don’t have a soundproof studio, or expensive sound canceling equipment, the microphone might capture ambient sounds. DIY recordings are also likely to contain clicks, pops and other mouth noises. When we’re talking to our friends or even giving a presentation, we don’t notice that our Ps pop and our Ss sizzle, but the microphone hears it all. You want the reader to focus on your book, not listen to distracting, unrelated racket while trying to enjoy your audiobook. Volume must be consistent which requires know-how and equipment. Even your mood change from one day to the next can be obvious when you’re narrating your own work. The submissions may vary from dreadful to outstanding, from boring monotone, to sparkling character interpretations. The actor I hired for Secrets Lost, Rosemary Benson, nailed the character’s accents, gender, personality, mood, and age as if she stood at my elbow as I wrote. Rosemary asked for help with pronunciations of character names and local places, like the wonderful Washington coast destination Kalalock, locally pronounced clay-lock. Edits were painless because she knew what she was doing and had the right equipment. Listen to every word with the book in front of you. Review just like you reviewed the manuscript after the editor finished the word doc. Be certain the narrator says exactly what you wrote. You’d be surprised how easily 1890 can turn into 1980. Let us know if you need assistance producing your self-published audiobook, we’d love to help you.